The old rock building that houses the Gordon Community Library & Museum is said to be the oldest structure in Gordon. The building was donated to the city by the Barton family. Here is the story of the building as written by John Boyd Harlin, son of the man who once operated a store in the building. The building was built somewhere between 1880 and 1900 from sand rock taken from a quarry on top of Swank Mountain (the mountain that is on the northern edge of Gordon just east of Highway 919). It was built by Silas Graves, a local man, who had a store there, probably groceries. My grandfather, John Bunyan Harlin, and family moved to Gordon in 1891 from Carroll County, Mississippi. My father, John, was the eldest of four children and the only son. The others were Sallie (Mrs. Will Blewett) of Gainesville, Texas, Ellie (Mrs. A. P. Wilbar) of Gordon and Alma, (Mrs. H. P. Henegar) of Gordon. My grandmother died in 1909 and my grandfather lived with Alma and her husband until his death in 1935. Dad, who was about 25 years old when they came to Texas, worked as a salesman for several General Merchandise Stores for about 30 years. The stores were Thomas Dyer, Eaton-Blewett, J. M. Oden and J. R. Rice. Dad became ill and was unable to work for a good while in the early 1920’s. When he began to get back on his feet physically, he decided to go into business for himself which was to buy and sell a boxcar of SEED POTATOES right out of the car parked on the railroad side track here in Gordon. Later, he bought and sold two more car lots of potatoes, one for seed and one for eating- priced about $1.50 per hundred. Dad was not a rich man in coin of the realm but he had a multitude of friends which was worth much more. He made many a friend and a customer for life with a sack of candy. He also tried to have a saleable outlet for anything the farmer had to sell. His motto was: BUY ANYTHING – SELL EVERYTHING. 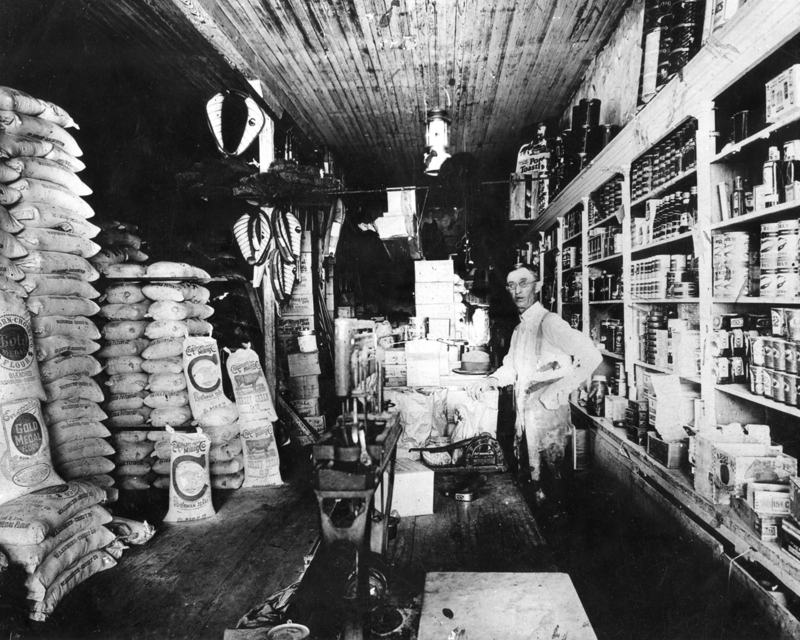 In about 1922, the old rock building became his store, handling mostly grocery staples: flour, sugar, coffee, lard, beans, canned goods and of course, tobacco. In time the business grew due to hard work, long hours, a good credit and some very good wholesale connections. An adjoining building, about six feet to the north of the rock building, a wooden frame was rented and used as a feed and store room. The area to the west of the buildings was converted into a large pen for chickens as purchased and later shipped to city produce markets. Also barrels were used for storing brine for green cow hides later to be shipped to the city dealers in hides and leather goods. In time, the rock building grew too small for the merchandise stored for sale and I heard it said, in a joking manner, that once you got in the front door you had to go through to the back door and go out in order to turn around. I remember the purchase of a car load of Gold Medal Flour in 48 lb. bags. We also handled Big C, a Texas flour milled in Sherman, Texas. Later on, Dad bought a small building from Robert Barton and moved to the lot just south of the rock building. We used it as a place to test and store cream purchased locally until the evening passenger train stopped to pick up passengers, mail and express. In the latter part of 1928, Mr. J. W. Conway approached Dad with a deal to sell out the Conway store. Mr. Conway, at that time, was getting up in years and not able to take care of the store and his many other affairs. In December, Dad bought the Conway Merchandise and rented the two buildings just south of the present First National Bank. Another thought about the Old Rock Building: I remember its being in this form but as I have been told the interior has been changed over the years. As you face west from the front door on the east, there was a fireplace in the center of the west end, a window to the right of the fireplace and a regular door to the left. A few feet from the outside west wall was an underground cistern. I remember one 4th of July we had a rather cool spell of weather and Dad built a fire in the fireplace, not that we exactly needed it but it still didn’t feel bad! In regard to the Fisher Wagon Yard, it was usually used mainly as an overnight parking place for wagons and teams with stalls for the teams and mangers for feed. Mr. Fisher had a small building to serve as an office and storeroom for feed on the south side of the yard. He later used this little building to house his grist mill with which he ground corn meal. Later on, this little house became the first Mule Barn in Gordon, (so called by the men and boys who played dominoes there). The daytime visitors in Gordon had no trouble finding a parking places for their wagons, buggies and later on Model T’s in the several vacant lots and some spaces behind several stores. In respect to the present Fire Hall, I barely remember when a row of wooden frame buildings stood the length of that block with a plank sidewalk. In time, they were worn down and replaced by the present brick sidewalks. My first memory of these buildings are: The building on the north, next to the highway housed the first Light Plant. It was only run at night for that was the only time we needed lights to replace coal oil lamps. Later on, Mr. Dawson, the owner of the plant, sold to the ladies of the town, electric irons and agreed to run the light plant two hours on Tuesday morning so they could iron Monday’s washing. The center building housed a grocery store. The fire Hall building housed the Guarantee State Bank. After this bank merged with the First National Bank, the building was used as a movie theater. For a time after that, my father rented it as a storeroom for excess grocery stock. Later, Mr. C. A. Maddox, who had a grocery store in the center building, merged with this building to handle dry goods and ready to wear. Sometime later, Mr. Maddox went out of business to assume ownership and management of the hotel, later owned by Johnny Snoddy and wife. This building became the Post Office. This was sometime after 1928. The Post Office remained there until the present day Post Office was built in 1961.